ON/OFF FUNCTION Place your scale on a flat and stable surface away from any electronic equipment that may interfere with the scale. Press and release the ON/OFF button, wait until the display shows ¡§0.0¡¨ and the zerostable sign , you may now place the object you want to weigh on the platform. The scale can be read when the lock sign is shown in the display. TARE FUNCTION Turn on the scale as described above, place the ¡§tare item¡¨ on the platform, press the ¡§TARE¡¨ button to zero out the display, when ¡§0.0¡¨ appears on the screen you may now place items on the scale to be weighed. Once you are finished weighing, remove all objects from the scale, press the ¡§TARE¡¨ again to cancel the TARE FUNCTION. RETURN TO ZERO After weighing an item, if the display does not read ¡§0.0¡¨ press the TARE button to return to ¡§0.0¡¨ and you are ready to weigh again. CHANGE WEIGHING MODES Press the ¡§MODE¡¨ button to change weighing modes on your scale. 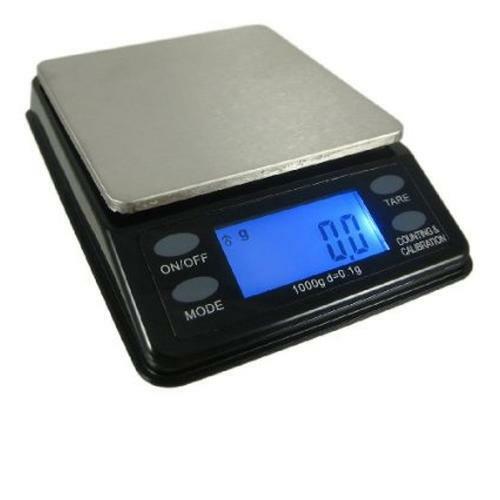 This scale has 6 weighing modes: g, oz, gn, ct, ozt, dwt. CALIBRATION With the scale turned on and placed on a stable surface, press and hold the COUNTING & CALIBRATION button. The display will show ¡§CAL¡¨, press and release COUNTING & CALIBRATION button again and ¡§500.0¡¨ will flash in the display, immediately place a total of 500g weight on the scale. The scale will reset itself and will give you a PASS message. Calibration is complete. PARTS COUNTING FUNCTION Place a small quantity of the item you want to count on the platform, (please note this should be a quantity of 10, 25 or 5opcs previously counted out by hand.) After the display shows the weight of the items, then press the ¡§COUNTING&CALIBRATION¡¨ button, the display will automatically show 10, use the COUNTING&CALIBRATION button to change your quantity selection until it is the same as the quantity on the scale. The ¡§PARTS¡¨ function will be set up automatically once you have chosen the quantity and wait for several seconds. Remove the items and the display will show ¡§O¡¨ you may now count out items as long as their total weight does not exceed 1000g. Once you are finished with the PARTS COUNTING FUNCTION, press the ¡§MODE¡¨ again to cancel the ¡§PARTS¡¨ function. OPERATING ENVIRONMENT The optimum operating temperature for the scale is 50-86¢X F/l 0-30¢X C. Rough handling of the scale will damage the internal sensor; so you must avoid actions such as shaking or dropping the scale. This is a sensitive piece of electronic equipment and will be affected by things such as moisture, extreme temperature changes, magnetic fields, careless handling and misuse.